I had an experience recently to renew my excitement to help transform hospitals with Lean. Our son’s pediatrician is helping us deal with his colic. The doctor said he wants to try one change at a time to determine what will help my boy. This is Plan-Do-Check-Act! Some organizations want to implement a ton of stuff at once. If the problem is fixed, it is difficult to pinpoint which of the myriad of countermeasures did the trick. If the problem is not fixed, they throw a bunch more changes to the wall to see what sticks. Our pediatrician patiently tries one thing at a time. Once the issue is resolved, he will then begin removing some of the counter-measures (medication and other soothing techniques) and continue to check that the colic is still gone. How often do organizations remove some of the counter-measures after they implement a bunch at once? PDCA is scientific thinking and doctors use it. My excitement is renewed because I see how using PDCA with providers will help make Lean relevant for them in hospitals. Keeping an open mind is important for innovation. So often our minds want to keep things the same or we may stretch to optimize how things are. An open mind will help you create something new. Common sense is woven throughout Lean thinking. While the concepts are simple, the applications of them are elegant. Going to gemba will be the key piece of evidence for you to concentrate on. The facts you witness and hear will help you make a good verdict for what improvements to make. Lean is about focusing on your customers and what your business needs to prosper. This focus helps you to be fair and honest while avoiding sympathy or prejudice. Pet projects or individual agendas may not always fit into Lean thinking. My wife and I are excitedly expecting our first son around the beginning of April. I am getting a first hand experience of what it is like to be a “customer” of a hospital experience and it makes me realize how Lean can really help. Effects of on-call: My wife’s OB advised that she can not guarantee she will be the one to deliver our child due to the fact that the little boy can arrive at any time of the day (understandable). There are 4 other doctors that would be covering for her if she is not available and we would have to schedule appointments if we wanted to meet them prior. As a customer, this adds a complexity and I would prefer a reduced number of on-calls. It would waste the other doctor’s times to meet with us if they did not end up being on-call on birth night. Design the pathway to be simple for the patient. Potential rushing: One thing that concerns me is the notion of doctors pushing the birth faster to fit their schedules. I am not sure how true it is, but from interviewing doulas and recent moms, some C-sections are given because the provider has other things to do or wants to go home (two cases as described to me). Our OB said the other day she might do a procedure “to speed things up”. If the patient chooses options to make things faster or it is needed for the health of the mom & baby – go for it. If the hospital system is not flexible enough to allow births to take a natural course (if patient chooses) and requires speeding up artificially, improvement is needed for staffing and room utilization to ensure you are providing value to patients. Unpredictability and non-standardized: From conversations it appears as though every experience changes greatly on which nurse you get that day and your provider. Babies and the human body are unpredictable and cause variation but some things CAN be standardized. As a customer, I would feel more confident if it was explained to me that the hospital has a generally predictable practice and have plans in place if the mom shows specific signs. Unpredictability is problamatic too from an insurance perspective since the hospital can not tell us who the expected roles will be to ensure each are covered so we can make an informed choice. As a customer, I would chose a hospital with standardized work over an organization who just tells me “it depends”. As a hospital customer, are my demands unreasonable? If you work at a hospital, what are your customers wanting? Do you agree or disagree with me that Lean thinking can help the hospital meet my needs? How Does Autonomy Fit Into Lean Management? Dan Pink’s new book “DRIVE” made me wonder how Lean management�will work with the book’s premise that knowledge workers seek autonomy.��Do standardized work and job instruction sheets take away from the need to have autonomy over what tasks people do, when they do it, who they do it with, and how they do it? Carrots and sticks work well for motivating people with algorithmic tasks (to some extent) but�cause damage when applied to heuristic tasks. One of the challenges at my hospital is that most providers think providing all elements of care is heuristic.� They each have their own special skills and experiences�to create care for the patient.� From a Lean perspective, we have variation and unpredictable results which cause waste.� Provider teams in the hospital are working at transforming some of these tasks to be algorithmic.� We�are able to meet our patients’ demands better, less people are idle, and supplies are getting closer to point-of-use. Despite these wins, is Lean thinking taking away autonomy by transforming heuristic tasks?� I do not think so but we have look at things a little differently. Just because a task is algorithmic does not mean creativity is lost and robots are created.� For patient care, maybe all of the steps leading up to diagnosis are algorithmic but the value added part is heuristic.� This frees up the provider’s mental capacity to focus on the true customer problem and not on the problems getting up to the customer. Another way of looking at this is that the problem solving part of everybody’s work is heurestic.� If every task is somehow transformed into a single pathway, your staff should still have the autonomy to recognize problems and experiment to fix them.� Helping people understand that their creativity will be focused on trying to improve experiences instead of trying to figure out what to do next or where something is. Lean management should strive to motivate people as autonomous knowledge workers.� Even if standardized work makes tasks look ripe for the carrot and stick treatment, recognize you are asking staff to be creative and solve problems. There is a trend towards removing the Japanese language or jargon from Lean transformations in the U.S. I understand why organizations would want to make lean thinking and the corresponding tools easier to digest, but I think we should seriously consider keeping it Japanese. People get used to new words and phrases better than you might think – Until a few years ago nobody knew what an iPod was. A cougar used to be a big cat and not a woman who likes younger men. Jewelry is now commonly called bling. There is no standard for Americanized Lean – Some call Gemba “three actuals (actual place, actual process, actual people)”, others brand it as “direct observation”, some refer to it as just “process walk”, and I am sure Gemba goes by other names. The problem with this is members of your organization can not easily learn Lean from external sources. Article and book authors tend to use the Japanese terms at least in reference but your staff may miss it if the original word is not shared with them. Lean transformation is a significant change and language should reflect that – A lot of Lean will seem counter-intuitive at first and there is a major shift in thinking that will take place on your journey. A significant change in the language will help communicate to the culture that things will be different from here on out. To paraphrase Deming, you are no longer using the language of the old world. Choosing the language of Lean is a strategic choice for your organization. It is easy to dismiss the notion of keeping the Japanese out and making easier translations. Please consider the pro side of keeping the original language. I am very interested in your comments. Dan Pink has an outstanding TED talk about how to motivate workers in the 21st century (some readers may need to open this post to be able to view the 19 minute video). Dan’s message about the difference between what science knows versus what business does will hopefully give you a new perspective. Leadership can get into a trap when it tries to get compliance instead of commitment or engagement. Dan discusses how incentives can do more harm for your business. The speech discusses the need to move from a reward by carrot or punishment by stick practice. Dan also speaks about an interesting study by Dan Ariely whom I greatly admire. I wrote about how his findings can help you connect actions to cost. Please comment with your reactions to Dan’s speech. To get new windows in our house it has taken a minimum of five installations due to lack of inspection. After the problems with the first installation (see part 1), I kept in constant contact with the sales person to ensure the windows that will be replaced are double-hung, has the same grid pattern, and the same energy efficiency. 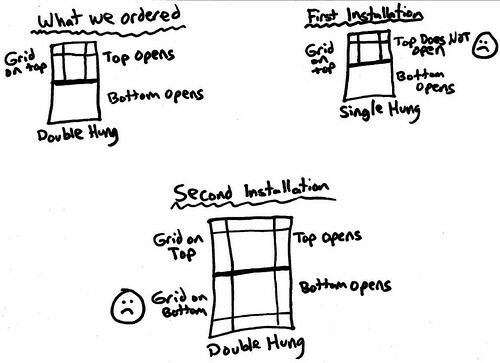 The sales person advised me the windows will be the exact same as the first installation except double-hung. I had a family member at my house while the crew came for the second installation since I have to work and they only come M-F 8:00-5:00. After the windows were installed, my family member called to advise there were grids in both the top and bottom glass instead of just the top (which is how the single-hung windows looked like at the first installation). We also advised the crew to inspect one of the other windows that were installed previously because the framing was chipped. The sales person advised me that I now have to work with the manufacturer since his company finished the install. The issue was now part of the warrantee with the window company and not the sales/installation company. The sales person told me the window company has a week backlog before they are even able to call people back to discuss problems. The sales person added that the window company will have to deal with the chipped framing as well. I finally got a call from the window company and they advised they will come out to replace the windows with the incorrect lower grids. I asked for an evening or weekend install and they refused. I asked them if their refusal was serious especially since it is to fix a mistake they made. They advised they were serious. The correct windows were finally put in for the third installation. They looked at the chipped framing window and advised they will come out again to replace it (M-F 8:00-5:00 only again). Luckily I happened to have had a weekday off to be there when they came a fourth time to fix the chipped framing but the installer ordered the wrong parts and needed to come back a fifth time. This Thursday will be the fifth time so my fingers are crossed but the cynic in me is expecting trouble. The sales/installation company should have done a quality inspection before spending the resources installing the wrong parts. The window company should have a better quality check before they wasted time building incorrect custom windows. I am sure there was a communication flow issue between the sales/installation company and the window company that can be standardized. The fact that there is a weeklong backlog before problems can even begin to be addressed should be seen as a problem for the window company. Getting to the root cause will help them fix the issue instead of always putting out fires. An understanding of what is value added to the customer will help both companies. I expect more value when a problem is identified but they treated the issue like it was normal. From my experience, most customers judge a company by how they deal with problems if they unfortunately encounter one. What other opportunities do you see for either company?